On April 6, 2014, James Grage, the co-founder/VP of BPI Sports completed the Second Annual Paralyzed Veterans of America Florida Chapter 5K Run, Walk & Roll. BPI Sports sponsored the event, which was created to bring awareness and generate support for Paralyzed Veterans of America, a nonprofit organization whose mission is to improve the lives of Veterans with spinal cord injury or dysfunction. James Grage pushes his quadriplegic friend, Michael Siyah, in the Paralyzed Veterans of America 5K Run, Walk & Roll. 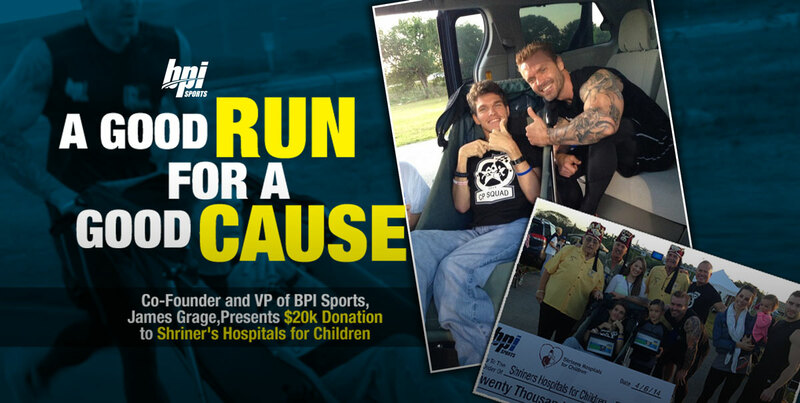 In addition to benefiting the veterans, BPI Sports had committed to donating $20,000 to Shriner’s Hospitals for Children if Grage could run one mile in six minutes or less. Shriner’s Hospitals for Children provides treatment for children in the specialty areas of: orthopedics, burn care, spinal cord injury, and cleft and palate – regardless if a family can pay. This was an especially daunting challenge, as Grage had not run in over 15 years due to a serious accident. Grage crossed the finish line completing the mile sprint in six minutes, all while pushing longtime friend Michael Sayih, a quadriplegic that suffers from Cerebral Palsy. The race was a success and a $20,000 donation was made on behalf of BPI Sports.